There are times when a modified bike simply stops you in your tracks and I’d like to think “The Mustard” does just that – for many reasons. Not just because of its unique look or stance, but because, when you look closer, it isn’t that far removed from a stock Forty-Eight, which is what we were aiming for. This then allows a lot more customers and Harley admirers to have the same, albeit with slight changes to make it truly their own. Additions like rearset pegs and lower handlebar are all possible for those who want them. Everybody takes inspiration to achieve an end result, we here at Shaw are no different. For The Mustard, ours came from some images of a modified Porsche. The lines, tones and rear light and exhaust layout tickled us enough to produce something similar. And before anyone asks, The Mustard wheels are standard items with neat inserts and tasty font for the Harley branding. Neil Sefton (42) – Head Technician, Speed and Custom. From an early age I was always changing, swapping and generally playing with different parts for different reasons including the washing machine. When I joined Shaw Harley-Davidson, many years ago, as part of the technical team, I was allowed to breathe, in the sense I was able to pool my technical skillsets and my passion for two-wheels with my imagination and creativity. Before too long I was heavily involved in building championship and show-winning custom Harleys and still doing so today for Shaw Speed & Custom, the custom division of Shaw. 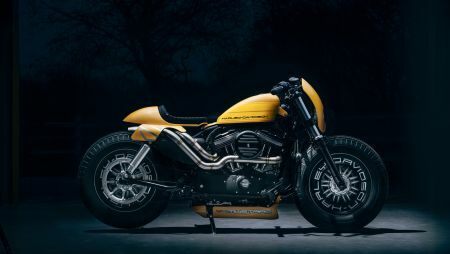 Stand out bikes with my touch are many but include “Strike True II” the bike that became the first machine from Europe – and the first Harley dealership entry – to win the coveted AMD World Championship for Modified Harleys. Oh! And then there was the Bell & Ross “Nascafe Racer”, which people still talk about today. H-D P&A: footrest, air cleaner, seat pipe, Nostalgic grips, Locking Acorn Nuts, Moustache Engine Guard, Rebound fork spring, Rear Axle Covers, swingarm pivot covers, Chrome Brake Disc hardware, Side Cover Mount Kit, Clutch Cover, Front Axle Covers, Centre Stand, Handlebar Kit. Other: Fuelpak, Firestone tyres, wheel covers, Kellerman rear indicators, Thunderbike front indicators, k-tech internal throttle, café racer seat unit, handmade carbon fibre fender for the headlight cowl.